Every print software solution needs to be connected/integrated, do not make any more decisions about print software without looking how this piece of software fits into your overall technology stack. When printers contact me about their web-to-print needs, I always ask “what Print MIS are you using?” When printers contact me about their Print MIS, production workflow, digital asset management system, or CRM I always ask about the other technologies that are currently being used in their organization. You can’t make isolated technology decisions any more – it’s inefficient and expensive to have islands of technology running your business. I like to look at your technology stack as a toolset that enables two workflows (your business workflow and your production workflow). Every single job has to travel through these workflows. 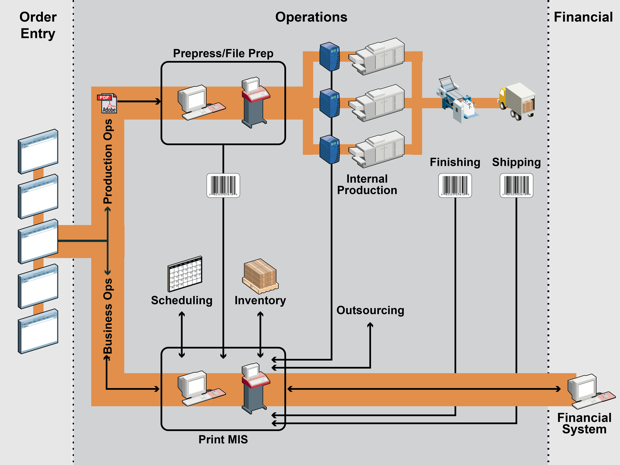 The result of the production workflow is the “product” for your customer, the result of the business workflow is the “product” for your company (an accurate invoice). Efficient print operations have technology that both solves the challenges necessary for the specific area (e.g. web-to-print enables your customers to order online AND connects to the next technology component in the workflow) and connects to the next step in the workflow. When your company needs to upgrade or improve in one area of your business, you have to think holistically. Step back and think of the big picture of your overall workflow before you make a procurement decision in a single area. Often the ability to connect different technology solutions is as important as the challenges the technology solves. Your workflow needs to be integrated from order entry to invoice – ideally in a way that removes all duplicate entry between systems. Integration is not a yes / no question (especially in a sales situation). Do you have current customers who have these two systems integrated in production? Can I talk to them? Are their additional costs for the integration? How is the integration supported? What data (specifically) is passed between the two systems? At what interval is this data exchange taking place (real-time, scheduled, triggered by events)? What happens when one side of the integration goes down or is unavailable? Are there any logs or dashboards to monitor the integration? How will we get alerted if there is an issue with the integration? What happens when one system needs to be upgraded? Your print technology decisions are interconnected, each purchase requires you to look upstream and downstream to determine the impact on either side of the technology purchase. You are building a puzzle where you want the pieces to fit together just right. You also want as few pieces as possible, too many printers add technology pieces without thinking through the long-term costs of supporting, maintaining, and integrating the various components of their technology stack. The cost of new software is just the beginning. You have to keep resources around to maintain it as long as it stays live in your business. The one thing we could all do more often and with greater fanfare – retire technology systems! When you get a new web-to-print solution, consolidate the one you’re replacing so you remove that complexity and the technical debt of supporting the old system. It’s very easy to leave systems up until they naturally retire, create a realistic plan right from the start, even if you intend to retire something over several years! Just like a business plan is a good idea to steer your business in the right direction, a technology plan is an excellent thing to create for your business. I’m not talking about a long, boring, useless report. I’m talking about a drawing with the major components of your technology stack, how they connect, and areas where you might consider changes moving forward. When you build this out be sure to abstract out the challenges the technology is solving, don’t get too attached to how it’s being done today – new technologies will solve challenges in new ways. Remember when we had to deploy full workstations all over the production floor to do shop floor data collection? Today’s technology allows low-cost tablets or other mobile devices – focus on the challenges, be open to new solutions!